Best Product Targets PowerPoint Templates And PowerPoint Themes 1012-Develop competitive advantage with our above Template which contains a picture of dart Board hitting the target of BEST PRODUCT. You need fewer and better products and you need to have the best product people possible thinking about making things better faster and more efficiently. Use this template to express the quality of your product.-Best Product Targets PowerPoint Templates And PowerPoint Themes 1012-This PowerPoint template can be used for presentations relating to-"The concept of best product, advertising, arrows, business, communication, competition Honest effort always shows through. 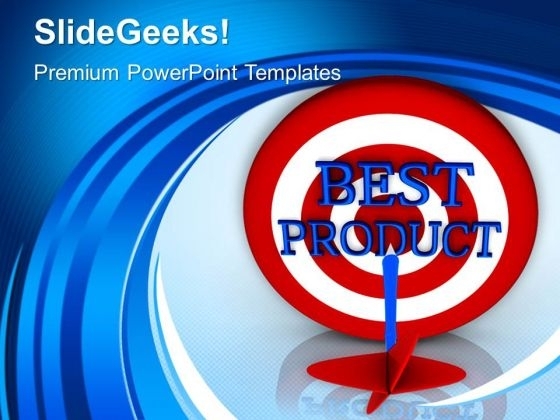 Our Best Product Targets PowerPoint Templates And PowerPoint Themes 1012 are a good example. Impress your organization with our Best Product Targets PowerPoint Templates And PowerPoint Themes 1012. Make sure your presentation gets the attention it deserves.